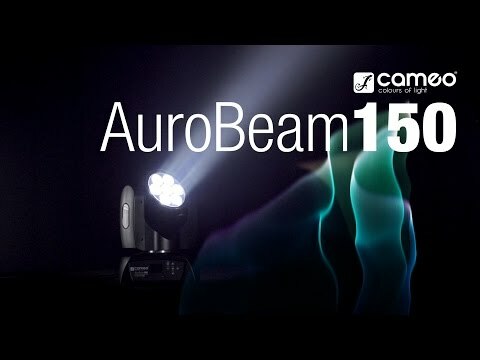 The Cameo AURO® BEAM 150 is an ultra-fast moving head with unlimited pan and tilt movement, 16-bit resolution and a 3,600 Hz refresh rate. Seven 15 Watt Quad LEDs produce rich RGBW colours, fresh pastel colours and vibrant shades of white with a 12° beam angle and a light intensity of 50,000 lux; Single Pixel Control ensures impressive pixel mapping effects. The professional features of the AURO® BEAM 150 include a low-noise temperature controlled fan, powerCON mains connectors by Neutrik and 3 and 5-pin inputs and outputs for the DMX signal. 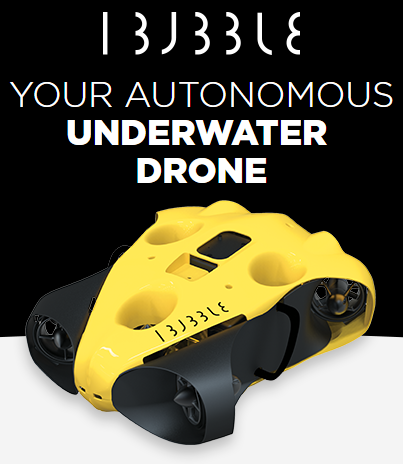 It can be operated fully automatically with programmable scenes or music, or used in standalone, master or slave mode; when using DMX, 5-channel, 11-channel, 19-channel and 41-channel control modes are available, with options that include dimmer and strobe functions. 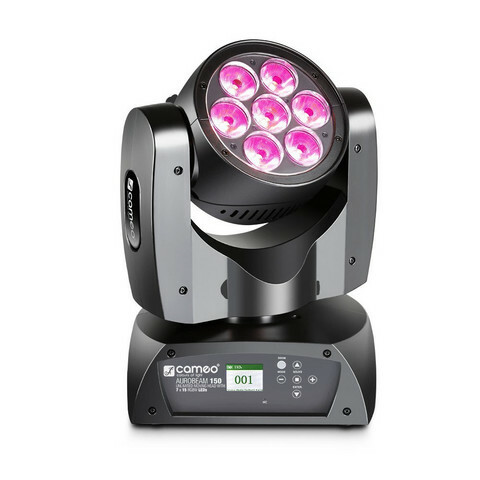 The rugged black metal and ABS housing of the Cameo AURO® BEAM 150 has 6 buttons and a backlit display for easy operation. The moving head can be used with all mains voltages from 100 to 240 volts and comes with a power cable and an Omega mounting bracket.